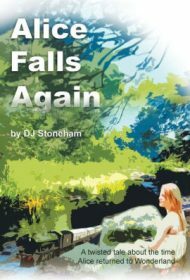 DJ Stoneham’s Alice Falls Again, is a wonderfully whimsical follow-up to Lewis Carroll’s seminal Wonderland books. Indeed, Stoneham portrays a Wonderland that’s in the grips of an existential crisis. Whereas Carroll’s novels featured creatures at play in a world without limits, rules or boundaries, this Wonderland has fallen under the sway of some evil force. The animals are forbidden to talk; inhabitants fear the wrath of a tyrant; and Wonderland resembles an unsettling nightmare more than a charming dreamscape. Alice is tasked with finding the root of this upheaval and correcting it. In revisiting Alice and her fantastical voyages, Stoneham imbues his prose with a wit and poetry that do ample justice to his source material. That’s no small task, considering the brilliance and depth of Carroll’s classic work. He offers bits of surrealistic poetry and imbues every chapter title with a play on words. At the same time, he delivers a genuinely interesting adventure, one that takes its cues from Carroll’s characters (the Jabberwocky makes a notable appearance), even as it delves into new territory; for example, Alice is about to leave for college, and her looming transition to adulthood influences her course through Wonderland. Stoneham’s marriage of familiar characters with a fresh take on a beloved tale makes Alice Falls Again an ideal fantasy for Carroll fans, and a lovely route to a treasured piece of literature for newcomers.